Looking for a super-moist bran muffin recipe? Try our Spiced Pumpkin-Bran Muffins! 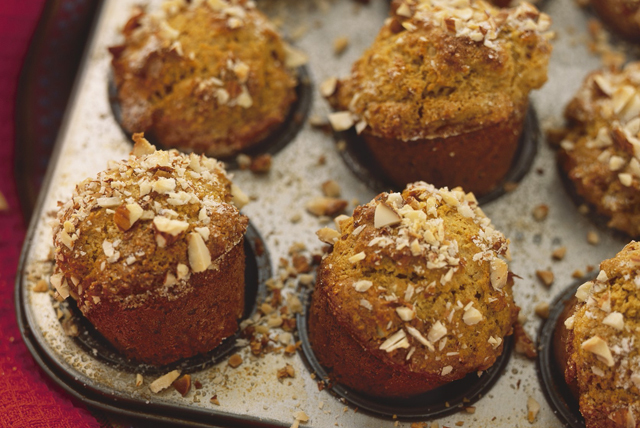 Made with natural wheat bran, canned pumpkin and pumpkin pie spice, these flavourful muffins provide a source of fibre. Combine first 7 ingredients in large bowl. Whisk all remaining ingredients except pumpkin and nuts in medium bowl until blended; stir in pumpkin. Add to flour mixture; stir just until moistened. Spoon into 12 muffin pan cups sprayed with cooking spray; sprinkle with nuts. Bake 20 min. or until toothpick inserted in centres comes out clean. Cool slightly before removing from pan to serve. Muffins can be baked ahead of time. Cool, then wrap individually in plastic wrap and freeze up to 1 month. Thaw, then reheat in microwave just before serving. Place remaining canned pumpkin in freezer container and freeze up to 2 months. Thaw, then use to prepare another batch of these delicious muffins.